What do you picture when you imagine a perfect vacation? Is there an ocean? Good food? Beautiful running paths? Amazing music? Your favorite person? For me, it is all of the above. We (re)discovered Asbury Park, NJ — a short train ride from NYC — a few years ago, and it quickly became our go-to destination for summer holidays and birthdays and I-just-want-to-go-to-the-beach-days. Two years ago, we treated ourselves for our anniversary with a stay at the Asbury Park Inn, a lovely bed and breakfast just three short blocks from our favorite part of the beach. To say that Kate, the co-proprietor with husband Joe, is a genius in the kitchen, would be an understatement. Each of our two mornings she cooked us a feast: amazingly creamy eggs with mozzarella, avocado, and tomato; peach and thyme breakfast cobbler; coconut chocolate chunk scones. That first morning, when Kate obliged me after I couldn’t make up my mind about which one thing to order, I think I waddled to the beach, with zero regrets. While everything was stunningly delicious, I have not been able to get those scones out of my mind. 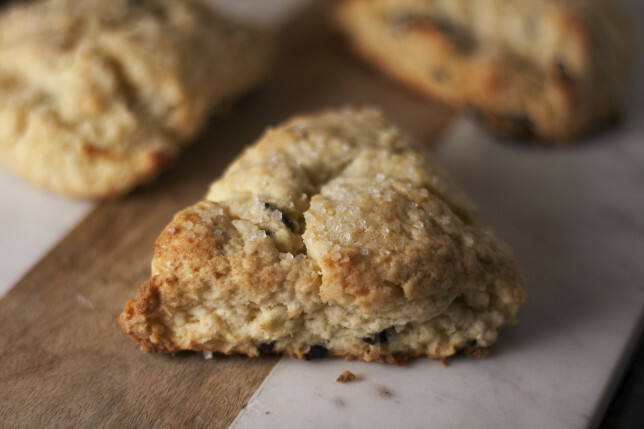 I’m a sucker for tender, proper British scones (with strawberries), and crumbly maple oat scones, but these are from another dimension. They have a lightness that can only be described as transcendent. I have never had anything like them. Even hours after they’ve been baked, they taste like they’re still straight from the oven thanks to the almost airy texture of the coconut. 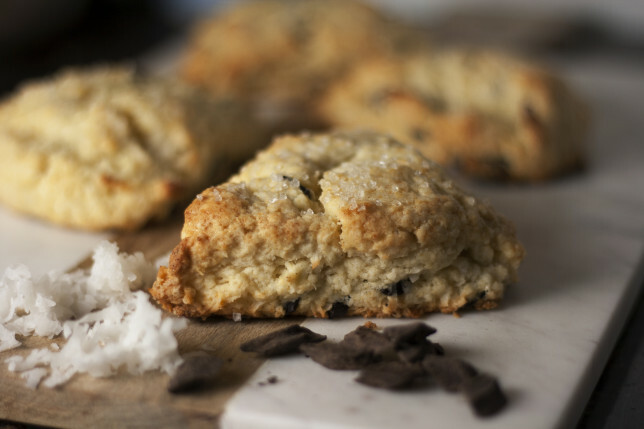 Perfectly sweet, the coconut mingles with the butter and balances the chocolate: there is a subtle, tender dance inside each scone, and each player is equal. I think what I love most about them is that they perfectly encapsulate the spirit of the Inn: the warmth, the generosity, the fun. It’s sort of what Asbury Park is all about. That first night, previous guests who had become Kate and Joe’s friends were getting engaged, and Kate was prepping congratulatory cocktails and delicious snacks. We all sat on the veranda together and drank and laughed, and then met up later at a bar on the boardwalk, where we continued to drink and laugh and be happy and silly. We’ve lost contact with the engaged couple, but Kate became sort of my pen-pal — for a long time we emailed about recipes and taking ownership of our lives and our happiness. I am ashamed to admit that my email to her is very overdue. I hope she knows how much she’s inspired me, how happy she makes people just by being the lovely person she is, providing comfort in the form of a smile and the most perfect coconut chocolate chunk scones this world has ever seen. In a small bowl, whisk together ¾ cup of cream and the egg. In a large bowl, whisk together flour, granulated sugar, baking powder, and salt. 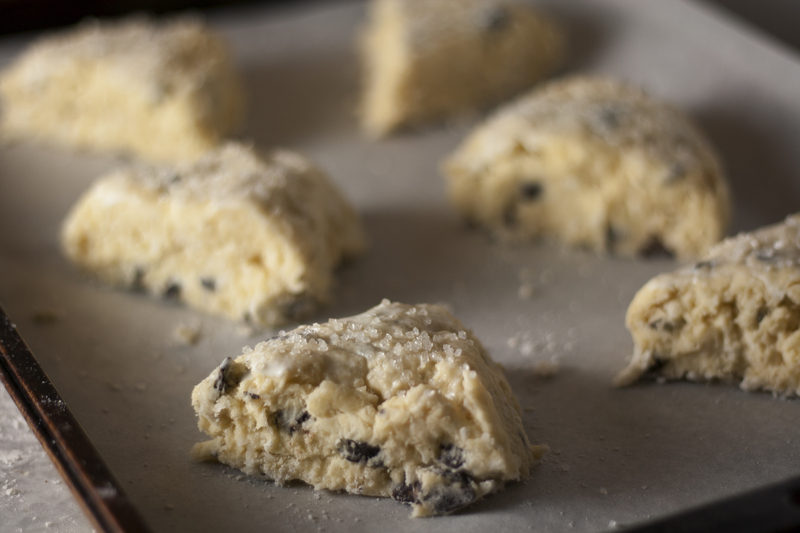 With a pastry blender or two knives, cut the butter into the flour mixture until it resembles a coarse meal, with some pea-sized pieces remaining. Stir in coconut and chocolate. With a fork, stir in the cream mixture until just combined. 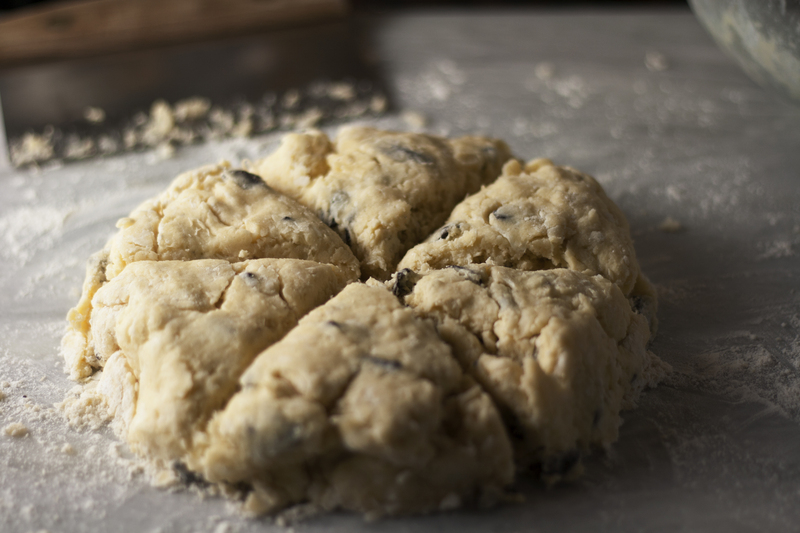 The dough will be rather crumbly. Turn the dough onto a lightly floured counter and press into a 6-inch circle. Cut into 6 equal wedges and transfer to prepared baking sheet. Brush with the remaining cream and sprinkle with sugar. Bake until golden, about 16-18 minutes, rotating the sheet halfway through. 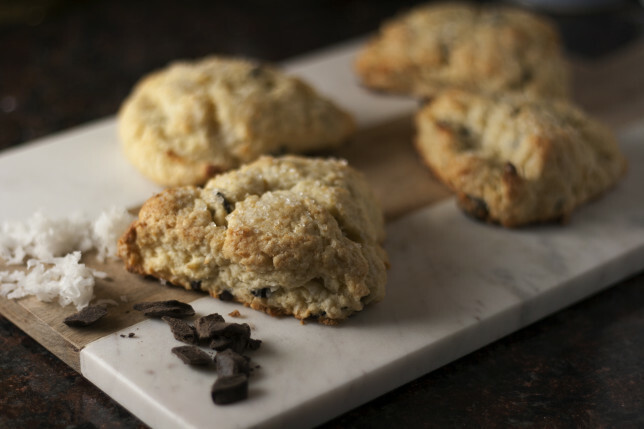 Scones are best eaten the day they’re made, but can be kept in an airtight container and brought back to life in a 300 degree oven for 7-10 minutes.